In September I was sent this lovely unit study from Solio Deo Gloria Resources to review, as a part of the TOS Homeschool Crew. We worked on this unit study with all the children. The unit study stated that it was designed for use by all grades, K-12; and I am happy to report we had a great response from the Junior, the Sophomore, and the 3rd grader. 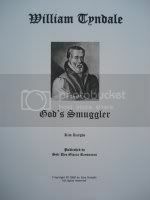 William Tyndale: God’s Smuggler is a unit study that is greatly enriched by several key resources. At the beginning of the study there is a list of videos, and books for you to choose from. Without using these resources, I believe the study would fall flat, and lose some of its interest. Kim, the author of these unit studies, offers suggestions on how to obtain the videos at little or no cost. We were able to use 2 of the videos from the list and one book. The videos were in my church library, and the book was at my local public library. The video on the left is from Answers in Genesis, the book is historical fiction, and the video on the right a cartoon story produced by Torchlighters. In combination, they gave us a very good perspective on the life of William Tyndale. My older children really enjoyed the Answers in Genesis film… it was a lecture/sermon, and was full of information. We watched it on the last day of our study and it helped tie everything together well. There were many activities to work on. We enjoyed the timeline, it was interesting to see who was alive when William was. We also enjoyed the translation, and printing press activities. Another way we made the materials ‘come alive’ was to lapbook some of the things we learned. While this was not a listed activity, we just thought it would be a fun way to collect and see the things we were learning. Here are two of our lapbooks. If you have never done a unit study before, this would be a great first time study to use. The price is very affordable at $8.00. The format is PDF (or E-book), so you receive it for download right away, and can print as many copies as you need.? Hop on over to Soli Deo Gloria Resources and browse their affordable and fun products. Remember to stop by the TOS Homeschool Crew page to see what other families had to say about Soli Deo Gloria’s products. as a member of the TOS Homeschool Crew, I received the above named unit study, free of charge, in exchange for my opinion of how this product worked in my homeschool setting. No other compensation was received. Very informative and well put together review…LOVE the pictures! This one sounds interesting- and wow what a great price too! I like all the photos you included! I LOVE that you included timeline pics! I too thought that using rubber stamps was a good way to do the activity. Lapbooking your work was an awesome idea! Your pictures really make the review. What nice lapbooks and timelines! Thanks guys! It was a fun study to do.